As time goes by, eyes need more light to see. Portable fixtures can provide the needed additional light and add a decorative touch. What is the best reading light (not too dim or too bright with glare) for my 70-year-old eyes? There is not a magic one-size-fits-all light, because individual vision varies greatly. Be sure to use dimmers so that the lights can be adjusted according to all lighting variables in your room. For older eyes, lighting professionals recommend using CFLs and LEDs with warm tones. Check the bulb package for a color temperature of 2700-3000 K (kelvins). Also, if listed, look for a CRI (color rendering index) of 80 or more. To control glare, choose a fixture with a shade or shield such that the bright part of the light source is not directly visible. Incandescent lights are not going away. Decorative bulbs will not be affected. The new standards apply only to typical screw-type bulbs that are 40, 60, 75 or 100 watts. You will continue to have a variety of choices when purchasing lights, including compact fluorescent, incandescent, halogen and LED. The new bulbs will save you money by lasting longer and using less energy. The U.S. will gain new manufacturing jobs as bulb manufacturers retool to meet increased demand for the more efficient lights. 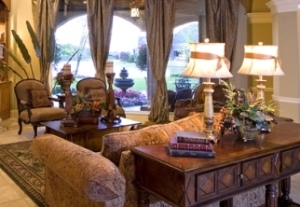 As people age, changing the surrounding lighting can go a long way to enhance reading ability and increase comfort. Everyone experiences changes in their eyesight as they age. Around age 45, most people start to notice a diminishing ability to focus on close objects. For many, it means using reading glasses to read a menu, newspaper or other small print. By 60, most people have a fixed focus optical system and need glasses. After age 60, eye and visual system changes accelerate, so less light reaches the eye and more light is needed to see details. Research shows that a 60-year-old needs twice as much light as a 30-year-old. Most of the commonly found lighting guidelines are written with the 30-year-old in mind. If you or someone in your home is older, turn on a portable lamp while watching TV to help reduce the contrast that occurs between the bright screen and the surrounding darkness of the room. Experts recommend using a table lamp or torchiere that provides an uplight as well downward illumination for versatility. Look for a lamp with a separate task light attached or with a glass bowl at the top that will bring some light downward.